Russ Little has a lot going on. The 37 year-old Idahoan has dozens of horses he uses for the company, Dry Ridge Outfitters. His four children, ages 14, 12, 10, and eight, all help out. It’s a busy place and the kids, said Little, have “on the job training.” The three daughters and son have learn to be quite resourceful. That’s pretty much how eight year-old Little’s son, Cody, ended up on a beautiful, 17 hand Percheron AND as a Facebook darling, with 10 million views and counting. 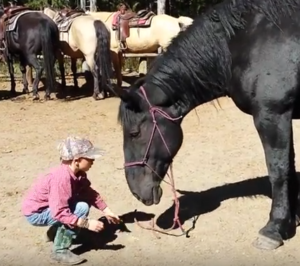 Little said the Percheron, Sheila, “is always a sweetheart.” Check out the video here. 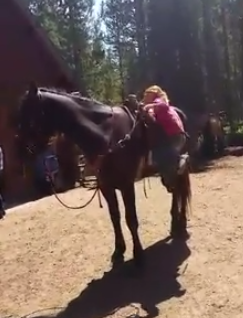 Just so you know, Sheila is not Cody’s regular riding horse. That would be Bud, a three year old Friesian-Percheron cross. He’s about 16 hands, said Little. Cody gets on Bud by grabbing the saddle strings and doing a variety of scrambling and pulling-up. Not to be outdone by her little brother: Watch Cody’s older sister getting up on her horse.